Lt. Jacqueline “Jack” Daniels of the Chicago Police Department is back, and once again she’s up to her Armani in murder. Someone is sending Jack snuff videos. The victims are people she knows, and they share a common trait—all were involved in one of Jack’s previous cases. With her stalwart partner, Herb, hospitalized and unable to help, Jack follows a trail of death throughout the Midwest, on a collision course with the smartest and deadliest adversary she has ever known. 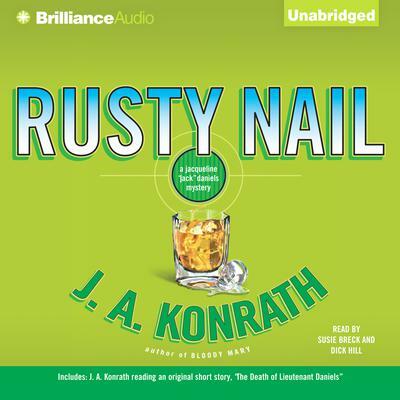 Rusty Nail features more of the laugh-out-loud humor and crazy characters that saturated Whiskey Sour and Bloody Mary, without sacrificing the nail-biting thrills. This is Lt. Jack Daniels’ third, and most exciting, adventure yet.